One approach is to create the Stage when the bundle's start method is called. When the bundle is stopped, it should clean up and thus dispose the Stage. Bundles may have an "Activator" which is an implementation of the BundleActivator interface. The interface defines a start method - which is called by the framework when the bundle is started - and a stop method - which is called by the framework when the bundle is stopped. (*) The JavaFX ready guitool must be used. It is located in the example.guitool.fx package. Pressing the "Stop" button in the guitool stops the bundle and closes the Stage. The entry Bundle-Activator defines the class which is called when the bundle shall be started or stopped. 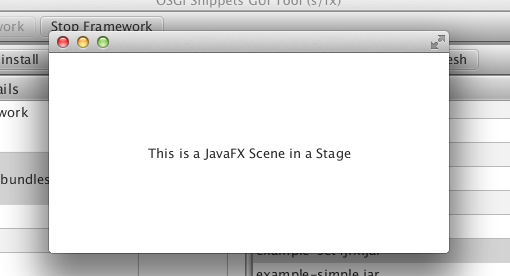 The entry Import-Package defines the java packages which shall be available to the bundle which in this case must include javafx.application, javafx.scene, etc. As a little exercise, you may want to change the Import-Package entry and see what happens. The build scripts create the Import-Package entry from information stored in the build.default.properties file in the project. This file is in the root of project bundle_set4jfx. In the line prj.bundle.import-package=org.osgi.framework, org.slf4j, javafx.application, ... remove the javafx.application package and save the file. Then build the bundle by either running build-bundles.xml or the project's build.xml script. Install the bundle and start it. The bundle information will contain "Activator start error in bundle" and the Eclipse console will show a " java.lang.ClassNotFoundException". Toll! Danke. Sie haben mir eine gute Idee gegeben. Jetzt will ich das auch unbedingt machen. Habe gerade viel Zeit frei weil mein Business viel erfolgreicher mit Datenraum Anbieter Vergleich geworden ist.